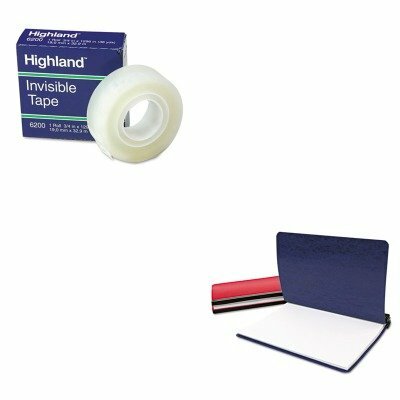 KITACC55260MMM6200341296 - Value Kit - Acco 3-Hole Laser Printer Hanging Expandable Binder (ACC55260) and Highland Invisible Permanent Mending Tape (MMM6200341296) | Payday Loans USA - F.S.H. strongMMM6200341296/strongBR/Highland Invisible Permanent Mending TapeBR/Economical, permanent adhesive tape is ideal for mending and splicing. Matte finish makes it virtually invisible on most surfaces. Polypropylene backing accepts most ink and pencil marks. Tape Type: Invisible Adhesive Material: Acrylic Width: 3/4quot;.BR/BR/strongACC55260/strongBR/Acco 3-Hole Laser Printer Hanging Expandable BinderBR/Expandable, professionally updated styling is suitable for a wide range of binding needs. Retractable storage hooks allow hang-up storage in standard file drawers. Adjustable flexible nylon posts allow maximum capacity with minimum storage space. Large spine label for easy identification of binder contents at a glance. Convenient carrying handle for transporting. Capacity Range Min: 1quot; Capacity Range Max: 6quot; Colors: Blue. If you have any questions about this product by Acco, contact us by completing and submitting the form below. If you are looking for a specif part number, please include it with your message.